For centuries, children have enjoyed spending snowy winter days outdoors sledding down hills. Today sledding has become such a popular winter pastime, ski resorts have even incorporated downhill tubing into their snow play offerings and independent tubing parks have cropped up in many areas that typically get lots of seasonal snow. Fortunately today, sledding and snow tubing can also be done a little safer. Years ago, the thought of wearing appropriate protective gear would be scoffed at, but today we know it can make the difference between life and death should an accident occur. It' s a lot of work lugging a sled up and down a hill. Dressing in layers can help your child stay comfortable. Opting for thermal underwear, a hat, gloves, neck and face covering, along with outer layers that are wind and water resistant can help keep your child dry and warm. Be sure to choose well fitting boots with good traction and wool, instead of cotton socks. Insisting your child wear a helmet could mean the difference between a minor and major injury should an accident occur. Other protective gear may include elbow and knee pads, goggles and sunscreen. 3. Choose the right sled. 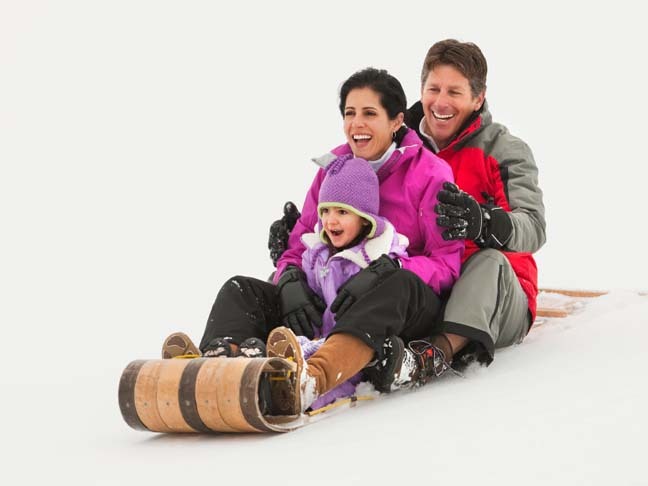 While a saucer shaped sled may look like fun, choosing a sled that you can steer may be safer if your child is able to independently maneuver it. 4. Pick an appropriate location. When choosing your sledding location, chose a safe, open path that is appropriate for your child's age and skill level. Avoid paths with trees, uneven terrain, ice, sparse snow, short paths and paths that end near a road, lake or other potential hazard. no sledding into snow banks. While sledding can be a fun way to enjoy the winter weather, it can be more enjoyable for everyone if the kids are well protected and prepared for safe fun.